Two Session High Performance Swim Camp – Sign up for one or BOTH sessions for your swimmer’s age group! Swimmers ages 11 & Under: Session one will focus on explosive starts and underwater dolphin kicking. Session 2 will focus on the long axis strokes: freestyle and backstroke. Swimmers ages 12 & older: Their first session will work on enhancing power with each stroke. The second session for swimmers ages 12 & older is designed to teach participants to increase their speed. Your clinician for this camp will be four-time Olympian and Olympic gold medalist Roland Schoeman! Roland has been a world record holder in several strokes in sprint races – he’s the ultimate tactician and the perfect teacher for this camp. He will be joined in the water by Olympian Elvis Burrows! Scroll down for more details on the curriculum! The start is your opportunity to cover as much ground as possible in a very short period of time, with great efficiency and momentum heading into your underwater kicking and breakout. There are countless intricacies to performing a start and you only get better with practice. Olympic gold medalist Roland Schoeman will share his experiences on how he found time to practice and improve his start both in and out of the water and teach your swimmer some of his most effective strategies to execute this explosive and athletic movement. FREESTYLE: Participants will reinforce holding a straight and solid body line so that they can cut through the water with less drag. Practice keeping a still and low head position (especially during the breath!) while driving a strong flutter kick. Roland will also teach participants how to get an early and powerful press backwards on the water in the arm pull to get more out of every stroke. This session will also cover tempo and length in the vast variety of different freestyle races to become a more strategic swimmer! BACKSTROKE: Engaging your core not only allows you to swim stronger, but it also allows you to hold the proper body position. Olympic gold medalist Roland Schoeman will help swimmers learn the importance of rotation and how to use it to their advantage for more power in each stroke. The arm pull in backstroke should press the water all the way through using the whole arm to achieve maximum propulsion. Backstrokers are often the fastest kickers on their teams, find out why and learn to have a stronger kick!! The first session for swimmers ages 12 & older will be all about intentionally building more power in every area of swimming fast. Learn from Olympian Roland Schoeman strategies for allowing each stroke to take you further! POWER TRAINING: Elite athletes have learned specific training exercises in the water that teach them how to hold on to more water AND increase their muscle strength! Participants will get to utilize resistance training tools and specific drills that will change the way they think and feel in the water for more power out of every movement. GETTING THE MOST OUT OF TRAINING: Every practice is an opportunity to get better. Is your swimmer taking full advantage of every opportunity? Roland will go over some physical and psychological strategies for how to get more out of every practice. DYNAMIC WARMUP: Certain muscle activations and stretches can helps swimmers to set themselves up to swim more efficiently the moment that they get into the water. Work with Roland to develop a dynamic warmup routine that will help prevent injury, improve flexibility, and strengthen the most important muscles in a swimmer's body. 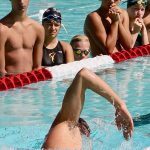 IMPROVING POWER IN STROKE TECHNIQUE: There are techniques that a swimmer can use in each stroke to create more power. Participants in this session will learn how to maximize the power of each movement through utilizing the correct muscles and having the proper technique. MAINTAINING ENTHUSIASM: For many swimmers, the biggest challenge during the hardest training of the year is staying positive. It is so hard to push yourself to your limits every single practice! Roland will help participants learn how to choose to have a positive and enthusiastic attitude that they can sustain through the toughest training of the year and beyond! The second day session of this camp for swimmers ages 12 & older will be all about speed! Having a fast reaction time and the RIGHT tempo can greatly improve a swimmer's times! Olympian Roland Schoeman will help swimmers learn how to maintain their technique and have the right mindset even when fatigue sets in. SPEED TRAINING: At this session, your swimmer will train their muscles to be more explosive in the essential areas of swimming with both speed and power. Roland will take the participants through a series of sets and in-water exercises to generate more speed in their racing. GOAL SETTING: One of the most common, and simplest, strategies individuals in any challenging situation use is learning how to set and go after their goals. Roland will help your swimmer set up their goals to improve their chances of reaching them. DRYLAND FOR SWIMMING: Doing a dryland program that compliments the work done in the pool is so important to preventing injury, improving range of motion, and increasing strength! Learn which exercises your swimmer should and shouldn't be doing to help them unlock more speed in the pool! MAINTAININIG TECHNIQUE THROUGH FATIGUE: We've all seen it and felt it... The moment where your muscles say "NO MORE" and your arms and legs begin to lose the technique that is so important to not only swimming fast but also preventing injury! Learn strategies to both mentally and physically get through that wall of fatigue to maintain technique and speed through the pain of fatigue. RECOVERY: Being an athlete doesn't stop when a swimmer leaves the pool. When you're an athlete, you're an athlete 100% of the time! That means practicing good recovery techniques between practices. Roland will teach participants proper nutrition, sleep, and recovery habits to accelerate the recovery process so that their bodies are less sore and more ready to work hard at every practice!